What Idiot(s) Brought Back Infinite Scrolling Websites? the doctor really wants to know because that (collective of) individuals should be tarred and feather! What is the doctor ranting about now? Back in the early days of the World Wide Web when HTML was in version 1.0, when Mosaic and Netscape ruled the web (before Microsoft released the horror called Internet Explorer upon the web), websites were relatively simple web pages that scrolled and scrolled and scrolled (as frames, which hadn’t yet been invented, were two years off and tabs further off still). CGI was still being invented (by the NCSA team) and it would be three more years before version 1.1 was formally defined (which would make dynamic web sites truly feasible and lay the framework for proper, real-time, pagination). Then HTML, CGI, and browser technology matured and we got well structured, properly paginated, well-designed web-sites. And these got better and better over time. And for those who kept up to date, mouse-overs, drill-down menus, dynamic animations, and even time-delayed responses. And properly used, these were all good improvements (as long as you could stop the animation or sound if you didn’t want it) and made the web experience better. But now, almost every fourth site is an infinite scrolling site, just like at the beginning of the web! And it’s driving me nuts. Once frames and pagination became common, only amateur sites were infinite scroll. Because who wants to scroll and scroll and scroll looking for the information they want? No one in their right mind! And for those of you jumping to the defense of these sites because they’re not really infinite scroll as you can expand and collapse the page dynamically with arrows and gestures, they’re still websites on one page! And with all of the progress we’ve made over the last 20 years, it’s ridiculous. I know it’s the newest fad, but it’s pathetic. Why? Because it represents an utter lack of imagination and innovation. And, in particular, on the part of the big web shops selling these sites. You see, these shops stay in business not by selling new companies websites, as it doesn’t take that much time or effort to throw up a web-site for a start-up (who won’t pay much for it anyway) because it can be quickly put together with a bit of custom imagery and provided content using a plethora of free open source blog, wiki, CRM, and even social network platforms. They make money by selling existing clients maintenance services and, more importantly, regular web-site upgrades because, every year, new technology is developed and a website that isn’t continually updated to use that technology looks antiquated and possibly abandoned (which, if you are a technology company, could make you, by association, look antiquated and possibly on the decline). So, every year or so, they have to come up with a must-need piece of technology that the web-sites of the majority of their clients must have so that they can sell upgrades and stay very profitable. But we have reached the point where we are at an inflection point. For the last few years, there have been no revolutionary new developments in web technology, just evolutionary ones, and we have reached the point where most technology solution providers have very modern, extremely powerful, web-sites and don’t need complete overhauls, just minor, regular maintenance. This is not very profitable, so these web site development companies need to either develop a new innovation, or, like a traditional consulting company when their business and attention is on the decline, come up with a new gimmick to get more work and increase their profit margin. And in this case, this is undeniably 100% gimmick. And, by definition, a 100% rip-off to their clients who, for the most part, probably already had great sites that just needed a little graphic touch-up, a slightly-streamlined information flow, and a little bit more social media technology. But even though I said otherwise, from a sales and marketing perspective, it is very imaginative — because it’s netting these web development companies not just one, but two — that’s right — two website upgrades. You see, just like in the early days of the web, it’s not going to take long before people realize that the infinite scrolling (web) site is the most annoying development to hit the web since … wait for it … the first infinite scrolling (web) site two decades ago! Once the web realizes en-masse that it was insanely stupid to bring back the infinite scrolling web-site, these web development companies will get an overload of web-site redesign requests for something … anything … better. And for this as well, they deserve to be tarred and feathered. Technology is about evolution and revolution, not devolution. the doctor‘s gears have really been ground to the point where he wants to go on TV and complain like Peter Griffin. This entry was posted in rants, Technology on June 30, 2014 by thedoctor. The Intersection of Talent, Technology, and Transition – How Do You Balance It? Supply Chains run on talent, technology, and good transition management — but it’s a difficult recipe to get right because it not only requires the right mix, but the right execution because, just like a soufflé, the perfect mix can still fall flat. So how do you get the right mix? And how do you execute it properly? Let’s step back a bit. For years, consulting companies and project managers said it is all about people, who do the work; process, that people follow; and technology, that people use to execute the process. And they were right. That’s a basic requirement for success in any company. But it’s not enough in today’s supply chains. And there’s two big reasons for that. First, we’re not in the industrial revolution where economic growth depends on manufacturing which runs on a production line where you need a lot of workers who do well defined, easy to teach tasks. We’re in the knowledge economy where you need educated, innovative, self-reliant growth leaders who can do a wide variety of tasks, dependent on the situation at hand. Warm bodies in seats are not enough anymore — you need talent. Second, with supply chains global and the participants many and dynamic, processes are no longer static as they were in the late stages of the industrial revolution where one company controlled the goods supply chain end-to-end and processes were well defined and relatively static. Now they are dynamic and have to constantly adapt as parties change, trade routes become temporarily inaccessible, raw materials and components become (temporarily) unavailable, and consumer demands and market availability changes. Static processes are not enough anymore, you need dynamic processes and transition management to manage them. The only component that hasn’t changed is the technology component, because technology is constantly changing and you still need the most advanced technology, just like you needed during the industrial revolution to keep up with your competition. However, the technology is always in transition and if your technology is too far behind, you may not be able to compete even with the best talent and transition management to throw into the mix. So we definitely need the right mix of talent, technology, and transition management to succeed — but how do we balance it in our supply chain to make sure the supply chain rocks (because we are the rock stars of the resource revolution)? The answer is simultaneously ridiculously easy and insanely complex. Your talent, technology, and transition management game plan must all be aligned. What does that mean? We’ll tackle that in an upcoming series of Sourcing Innovation white-papers this fall, and offer a few hints over the summer. So, keep your eyes here! This entry was posted in Best Practices, Talent on June 29, 2014 by thedoctor. 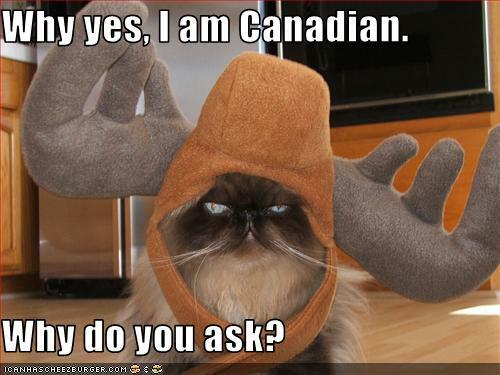 Looks Like LOLCat is Celebrating Canada Day a Wee Bit Early! This entry was posted in humour, Miscellaneous on June 28, 2014 by thedoctor. You are very well aware that you are understaffed and that you need to do something about it. You’re also aware that you may need to, or want to, outsource your category, project, or staff augmentation requirements. And, after our last two posts, you know that you better make sure that the category or project first passes the sniff test and lends itself to vended outsourcing before you get ready to ship it out. But you still don’t know if outsourcing is the best decision. How do you determine that? You compare it to your most viable insourcing option. And how do you make that comparison? More specifically, what is the ROI of going outside versus staying inside? If you’ve appropriately qualified the project, then you should have an expected return, which you used to determine whether or not the project was incentive-friendly. The base ROI is easily calculated as expected return / expected cost. The ROI inside will be calculated similarly. What is the expected cost of augmented staff and what return do you honestly think that person will achieve. Remember that, unless that person is a seasoned professional with lots of expertise in that category or project, that person is not likely to achieve the same return as a professional working for an outsourcing provider that tackles that type of category or project day-in and day-out. Plus, as they won’t have the same level of experience, or the same tools at their disposal as an outsourcing professional at the outsourcing service provider, and will have to deal with your organizational politics, policies, and ramp-up, it will take them longer. So even though the hourly rate of an internal resource may be lower, when you consider that more hours will be required for a lesser reward in the average, the ROI is not likely to be as high as you might initially think. In other words, while an outsourcing firm will always make the argument that outsourcing is the clear-cut solution, it’s not always. If they are willing to put their best on the line and the category or project is suited to them, it will usually be the case that outsourcing is the right decision. But if they don’t have an appropriate expert, it’s going to take them more time to deliver a lesser reward, which you might be able to top by bringing in a hot-shot pinch-hitter for a one-off project. In other words, there’s no one-size fits all answer and each project will have to be judged on the merits of keeping it in versus the merits of sending it out. And if you need help with that analysis, get a third party consultant to help you make that decision. This entry was posted in Market Intelligence, Outsourcing on June 27, 2014 by thedoctor. By now, you are well aware that you are understaffed and that you need to do something about it. You’re also aware that you may need to, or want to, outsource your category, project, or staff augmentation requirements. And, after our last post, you know that you better make sure that the category or project passes the sniff test before you ship it out. That’s a good start, but if the outsourcing is going to work, it probably has to be vested. So before you check off outsourcing as a valid option for consideration, make sure it meets the requirements for a vested outsourcing arrangement. A vested outsourcing arrangement is outcome-based, not transaction based. If the project is not focussed on an outcome, such as cost reduction, value add creation, etc., and is merely focussed on transactional invoice processing, it’s not a good candidate. A vested outsourcing arrangement can define the outcome irrespective of the how. The outcome can not only be clearly defined, but can be objectively measured against a well-defined scale. The measurable objective can be used as a foundation for performance incentives to incentivize the provider to perform better. The category or project lends itself to insight based governance, where you work with the supplier to overcome challenges and obtain better performance. If you check all of these boxes, then outsourcing is a very viable alternative. But is it your best one? At this point it all comes down to what your insourcing option is. So how do you make your final decision? We’ll address that in our conclusion to this series. This entry was posted in Market Intelligence, Outsourcing on June 26, 2014 by thedoctor.